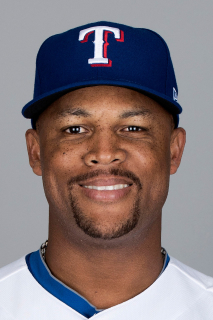 Adrian Beltre Perez…he and his wife Sandra have three children: Cassandra (2/13/04), Adrian Jr. (9/8/06), and Camila (10/1/10)…Adrian Jr. frequently takes batting practice against his father on the field prior to Rangers BP…attended Liceo Maximo Gomez High School in Santo Domingo, Dominican Republic where he played amateur baseball. imited by injuries to fewer than 100 games for just the 2nd time in his major league career, Beltre batted .312/.383/.532/.915 with 17 HR and 71 RBI over 94 games for Texas…still ranked among team leaders in doubles (5th, 22), hits (5th, 106), RBI (6th, 71), and walks (6th, 39)…his .915 OPS ranked 8th in the A.L. among players with 350+ plate appearances…over the period from 5/29-8/31, essentially Beltre's healthiest span of 2017, he ranked among A.L. leaders in RBI (3rd, 66), OPS (5th, .946), and batting avg. (9th, .316)…named Rangers Player of Month for both July (.341/.425/.560/.985) and August (.330/.408/.591/1.001) …selected A.L. co-Player of the Week for 7/24-30 (also SEA's James Paxton), a week which ended with career hit no. 3000, 4th time to win that award with Texas…Beltre's 0.75 BB/SO ratio was 2nd-best in any season in his career (0.77 in 2014), career-best 9.97 PA/BB…lone steal on 6/10 at WAS, and now has at least one SB in each of his 20 ML seasons…played with Dominican Republic in 2017 World Baseball Classic, going 1-for-15 in 4 games from 3/9-18. Earned Rangers' Player of the Year honors, starting 141 games at 3B and 10 as the DH…ranked among A.L. leaders in RBI (T9th, 104), PA per SO (4th, 9.7), avg. vs. LHP (5th, .331), avg. w/ RISP (7th, .331), GWRBI (T9th, 14), batting average (12th, .300), and OPS (12th, .879)…led club in RBI, walks (48), and total bases (304-tied) and was 2nd in batting average, games (153), hits (175), extra base hits (64), homers (32), runs (89-tied), and doubles (31-tied)…joined DET's Victor Martinez (2014) as only batters since 2010 with a .300/30/100 season on fewer than 70 strikeouts, just the 3rd such season in Rangers history (Rafael Palmeiro and Ivan Rodriguez, both in 1999). Started 142 games at third base and one as the DH…despite being bothered for much of the year by a left thumb injury, ranked second on the club in batting average (.287) hits (163), and sacrifice flies (8), tied for second in runs (83), doubles (32), and total bases (257), third in RBI (83), and fourth in homers (18)…had four triples, most since 2006 (4) after three combined triples in his first four seasons with Texas …was selected A.L. Player of the Week for final week of season (Sept 28- Oct 4), his eighth career weekly honor…tied career high with three walks on July 22 at Colorado, sixth time and first since April 29, 2008 at Cleveland. Was the Rangers Player of the Year...started 136 games at 3rd base and 12 at DH...produced the A.L. 's 3rd highest on-base percentage (.388) and 4th best batting average (.324) while also ranking among the league leaders in intentional walks (5th, 13), multi-hit games (T8th, 54), hits (9th, 178), and slugging (10th, .492)...led the Rangers in batting, runs (79), hits, extra base hits (53), total bases (270), homers (19), RBI (77), on-base and slugging percentage, placed 2nd in at bats (549), doubles (33), and walks (57), and was 3rd in games (148)...matched his career best in on-base percentage (2004) and had 2nd most walks (61 in 1999)...became just the 4th Ranger ever with minimums of a .324 batting average, .388 OBP, and .492 SLG in one season, joining Rusty Greer (1996), Rafael Palmeiro (1999), and Josh Hamilton (2010). In his third season with Texas, batted .315 with 30 home runs, 32 doubles, and 92 RBI in 161 games/starts … led A.L. with 199 hits and ranked among league leaders in multi-hit games (T2nd, 58), intentional walks (T4th, 12), total bases (5th, 321), slugging (8th, .509), home runs (T8th, 30), and RBI (T11th, 92)…set career highs in games (3rd in A.L.) and at-bats (631, 7th in A.L. )…had 146 starts at 3B, 15 at DH…left game on June 1 vs. KC with a mild left hamstring strain, and would not play the next 2 games/3 days, but would finish the year with that lingering injury, including tweaking the hamstring while scoring in the 6th inning of game no. 162 on Sept. 29 vs. LAA…the 2 games June 2 and 4 would be his only games missed (and non-starts) all season. Was the Rangers Player of the Year...tied for the A.L. lead in GWRBI (19) and ranked among the leaders in average (3rd, .321), total bases (3rd, 339), sacrifice flies (T3rd, 9), hits (4th, 194), slugging (4th, .561), multi-hit games (T5th, 56), homers (6th, 36), extra base hits (6th, 71), RBI (9th, 102), and runs (10th, 95)...led the club in average, hits, and total bases, was 2nd in homers, RBI, slugging, and on-base percentage (.359), and placed 3rd in doubles (33) and runs...marked the 6th season in Rangers history in which a player posted minimums of a .315 average, 35 HR, 100 RBI, and 95 runs scored, 1st since Alex Rodriguez in 2001...joined Miguel Cabrera and Ryan Braun as the only players to post those figures in 2012...set career high for sac flies and totals for runs, hits, total bases, and homers were 2nd most of career...had 129 starts at third base and 23 as the DH.BATTING: His .3212 average was the 2nd best of his career behind .334 in 2004 and ahead of .3209 in 2010...was the 3rd best ever for a Rangers 3B behind Buddy Bell (.329) in 1980 and Michael Young (.322) in 2009...went 6-for-26 in season's 1st 7 games then hit .338 (54-160) over next 39 contests and was at .323 through June 1...batted .182 (8-44) in next 11 games to fall to .296 on June 13, the last time he was under .300 all season...had a .400 (40-100) average in next 26 games and was at .327 through July 15...hit .234 (29-124) in following 32 contests, falling to .302...beginning August 22, batted .377 (55-146) over his final 38 games, including .436 (17-39) in last 10 contests...hit safely in 20 of 21 games with a pair of season best 10-game batting streaks, May 10 (2)-19 and May 21-June 1...had 4 hits twice, August 22 vs. BAL (cycle) and August 31 at CLE...ranked 3rd among A.L. qualifiers with a .339 batting average vs. RHP and was 5th in hitting in both day (.318) and night (.322) games...hit over .300 in 5 of season's 6 months with high of .343 in June...over past 3 Septembers, has batted .341 (101-296) with 28 HR and 62 RBI in 76 games INJURIES: Played in 156 of the Rangers' 162 games - pinch-hitting in 4 of 6 non-starts...started 119 straight from May 7-Sept. 18...missed starts April 22-23 (2) and May 1-6 (5) with left hamstring injury...missed 2 games on road trip Sept. 19 and 21 with intestinal/abdominal issues...forced to leave game Sept. 12 vs. Cleveland with left shoulder strain, but MRI showed no structural damage and forced his way into the lineup as designated hitter the next night (going 2-3 with a BB)...reaggravated left shoulder injury in first game on Sept. 30 vs. LAA and exited the night game, but was in lineup as DH the next night...MISCELLANEOUS: Had back-to-back 3-hit games with 4 total HR in those contests Aug. 22-23...was 1st A.L. player to do that since the Rangers' Alfonso Soriano on May 6-7, 2005 vs. CLE...scored 1000th career run on April 14 at MIN...batted .344 (32-93) with 4 homers and 14 RBI as the DH...had walk-off 1B in bottom of 9th, Sept. 24 vs. OAK. In his first season with Texas, Beltre became just the thirddifferent 3rd baseman in club history with 30 homers and 100 RBIwhile playing outstanding defense...despite missing 37 gameswith a hamstring injury, ranked among the A.L. leaders in slugging(3rd, .561) homers (T5th, 32), and RBI (T6th, 105)...led the clubin slugging and was T1st in HR, placing fourth in runs (82) andfifth in hits (144)...also reached career milestones with his 2000thhit and 300th homers, one of 13 active players to accomplishboth...started 112 games at 3B and 11 at DH. In his lone season with Boston, batted .321 (189-589) with49 doubles, 28 homers, and 102 RBI in 154 games ... the 49 doubleswere a career high and led the majors last year...posted 2ndhighestfigures of his career in batting average, hits, home runs,RBI, extra-base hits (79), total bases (326), on-base pct. (.365)and slugging (.553) ... only year with better marks in all of thosecategories was 2004, when he was 2nd in N.L. MVP voting ... ranked among A.L. leaders in hits (T3rd), average (4th), totalbases (5th), slugging (5th), and multi-hit games (T5th, 53), leadingRed Sox in all of those categories ... according to Elias Sports Bureau,became just the 5th player ever with a .300+ batting average,20+ home runs and 100+ RBI in his first season with the Red Sox,joining Jimmie Foxx (1936), Ted Williams (1939), Carl Everett(2000) and Manny Ramirez (2001). Made a pair of trips to the disabled list, missing 51 games in his last season with theMariners...Played in 111 games, fewest since his rookie season in 1998...Finished 6th among AL third basemen with a .959 fielding percentage (14 E/341 TC)...Passed Jim Presley as Mariners all-time leader for hits (740) and extra-base hits (280) as a third baseman...Knocked 8 homers, snapping string of 3 consecutive 25-plus homer seasons...Despite missing extended time to injury, ranked 3rd on SEA with 27 doubles and 6th with 35 extra-base hits...Combined to bat .319 (45-for-141) in 34 games batting in the 2 or 3 hole in the lineup...Was a .240 hitter(74-for-308) when he hit 4th or 5th...Hit 1st homer of season 5/9 at MIN...Came in his 31st game of the year and snapped a string of 150 plateappearances without a homer...Made only 1 error during 42-game stretch from 5/10-6/28...Recorded all 3 RBI in 3-2, walk-off win vs. BAL on 6/3...Notched 10th career walk-off hit, a single in the 9th...Logged a pair of season-high, 8-game hit streaks: 6/7-16 (.424, 14-for-33) and 8/5-12 (.444, 16-for-36)...Placed on 15-day DL on 6/30 (retro to 6/29) recovering from surgery on his left shoulder to remove bonespurs...Surgery performed by Dr. Lewis Yocum in LA on 6/30...Reinstated on 8/4...Also on 15-day DL 8/13-31 with a severely bruised right testicle. Appeared in 143 games, making 142 starts (3B-137, DH-5)...Awarded the AL Gold Glove at 3B for the second consecutive season...also won the Fielding Bible's award as the Majors best third baseman...Had season-ending surgery on his left thumb and left shoulder Sept. 18...surgeries were performed by Dr. Carlton Keck (thumb) and Mariners Medical Director Dr. Edward Khalfayan (shoulder)...played final game of the season Sept. 14 at LAA...Hit team-leading 25 home runs (T15th in AL)...third consecutive season with 25-or-more homers...became the fifth player in club history to lead the Mariners in homers in consecutive seasons (R. Zisk, 1981-82; K. Griffey Jr., 1992-94, 96-99; B. Boone, 2003-04; R. Sexson, 2005-06)...Became just the fifth player in club history to hit 25-or-more homers in three consecutive seasons...joins Alex Rodriguez (1998-2000), Edgar Martinez (1995-98), Jay Buhner (1991-93, 95-97), and Ken Griffey Jr. (1992-94, 1996-99) in the exclusive club...Hit for the cycle Sept. 1 at Texas...went 5-for-6 with 5 runs scored...became fourth player in club history to hit for the cycle (first since John Olerud, 6/16/01 at SD)...tied a club record scoring 5 runs and became the first player in club history to record 5 hits and 5 runs in the same game...Arizona's Stephen Drew also hit for the cycle on Sept. 1, marking the first time since Sept. 17, 1920 that two players hit for the cycle in the same day (Bobby Veach and George Burns)...Hit 6th career walk-off home run (2nd with SEA) Aug. 25 vs. Minnesota...snapped a 2-2 tie with a 2-run homer off Jesse Crain in the 11th inning...Recorded three multi-homer games (5/30 vs. DET, 7/28 at TEX, 8/31 at CLE)...2nd-most multi-homer games in a season in his career (7 in 2004)...19 career multi-homer games, including 8 as a Mariner (T7th in club history)...Season-high 15-game hitting streak, Aug. 24-Sept. 12 (.452/28x62, 5 HR, 13 RBI)...T4th-longest hitting streak of his career and longest since a 16-game streak Sept. 11-26, 2006...raised season average 24 points from .246 to .270 during the streak...Ranked 7th in the AL batting .340 (51x150) with 8 homers and 22 RBI against left-handed pitchers...compares to .239 (97x406) with 17 homers and 55 RBI vs. RHP...4th on the club with 43 multi-hit games and T2nd with 22 multi-RBI games...recorded 11 games with 3-or-more RBI, including season-high 4 RBI July 28 at Texas...Led AL third basemen in assists (272), 2nd in putouts (100) and double plays (27), and 4th in fielding percentage (.964/14 E, 386 TC)...made only 3 errors over his last 62 games for a .983 FLD% (after July 3). Led Seattle in home runs (26), doubles (41), T2nd in RBI (99) and steals (14)...won AL Gold Glove, becoming first Seattle 3B to win the award...led AL 3B in putouts (121) and ranked 2nd in assists (287)...26 homers ranked T11th in the AL...among American League third basemen, was first in doubles, 2nd in homers, 3rd in RBI and 5th in average (.276)...tied the club record (twice) with 4 extra-base hits in a game: was 5-for-5 with 2 doubles and 2 home runs, July 6 at Oakland; was 4-for-5 with 2 doubles and 2 home runs May 28 at LAA...13 total bases July 6 ranked T3rd in club history...one of just 12 players in the modern era (since 1901) to record a pair of 4 extra-base hit games in a season...hit pair of home runs on May 28 was the 15th multi-homer game of his career and marked career home runs #199 and #200...had 30 RBI in July to lead the Majors; was most in a month in his career. Beltre had 18 home runs and 54 RBIs in the second half of the season. He also had a career-best 39 doubles in 2006. Beltre had a game-winning, walk-off home run against the Yankees on Aug. 21. He had a 16-game hitting streak from Sept. 11-Sept. 27. Beltre had the first inside-the-park home run at Safeco Field on July 24. He also hit safely in 16 of the Mariners' 18 Interleague games. Ranked third on the Mariners in at-bats (603), hits (154) and RBI (87)...in his first season with Seattle...reached 80 RBI mark for the third consecutive year...His .967 fielding percentage ranked tied for seventh among qualifying big league third basemen and fourth in the American League...his 14 errors were the second-fewest of his career in a full season...involved in 26 double plays, sixth-most in the Majors among third basemen...Played in 156 games, the fourth straight season with at least 156 games played...Fanned a career-high 108 times...Batted .321 (26x81) in June after hitting .236 (47x199) combined over the season's first two months...Batted .264 (76x288) over 73 games in the three spot in the batting order...moved to the fifth slot in and hit .248 (75x303) over 80 contests...Notched a season-high 10-game hitting streak from June 11-16 (15x36/.417)...Missed five games due to tightness in his left hamstring from June 14-18...Logged Major League hit number 1,000 on June 6 vs. Tampa Bay...Blasted sixth career grand slam in the first inning on Aug. 17 vs. Kansas City...His two-homer game on July 2 vs. Texas was the 12th of his career...was his first multi-homer contest since Sept. 21, 2004 at San Diego...Had a 31-game errorless streak, including none in July, after a career-high tying three on June 30 at Oakland (second time)...was his third errorless month of his career (June 2004, June 2000). Led the Majors with 48 home runsin final season with Los Angeles...Ranked among NL leaders inbatting average (.334/4th), RBI(121/4th), hits (200/4th), totalbases (376/2nd), extra base hits(80/T5th) and sluggingpercentage (.629/4th)...Tied ML record for homers in aseason by a third baseman (also:Mike Schmidt, 1980)...Collected career HR #100, April 6vs. SD to become the 36th playerin ML history to hit 100 HR by his25th birthday; joined Lou Gehrigand Cal Ripken as the three players with exactly 100 on 25th birthday...Had seven multi-HR games (May 1, June 6, June 27, July 3, Aug. 19, Aug. 20 and Sept.21) and now has 11 career...NL Co-Player of the Week June 21-27...Slugged seven homers in Interleague Play, second most in the Majors...One of three ML players in 2004 with three grand slams (July 24, Aug. 24 and Sept. 27)...Hit game-winning walk-off homer July 24 vs. San Diego...Homered Aug. 24 at Montreal to become the 12th third baseman in ML history with 40homers in a season...Had career-high five hits Aug. 28 at New York Mets...Led Majors with 13 homers in August...Named NL Player of the Month for September...Led the Majors with 26 homers after the All-Star Break...Played entire season with bone spurs in his left ankle. Among NL third basemen, ranked tied for fourth in homers (23) and was fourth in RBI (80)...23 homers were a (then) career high and tied for the seventh-most among big league third basemen...batted .333 (18x4) with runners in scoring position and two outs... had 31 multi-hit games including two four-hit games and 10 three-hit games...ranked second in double plays (28), third in assists (307) and fourth in total chances (440) among NL third basemen...became the 63rd player in Veterans Stadium's history to reach the upper deck when he homered on July 31 at Philadelphia...had the game-winning hit on three consecutive days from Aug. 6-8 vs. Cincinnati and Chicago Cubs...slugged a three-run walkoff homer in the bottom of the 10th inning on Aug. 20 vs. Montreal, the Dodgers' only game-ending homer of the season...was second in NL with 26 RBI in August... tied his career high with four hits for the ninth time, as he went 4x5 with two homers and three RBI on Sept. 5 at Colorado...went 4-for-5 with three RBI on Sept. 7 at Colorado, his second four-hit game in three days...went 3x4 with two homers, his fourth career multi-homer game on Sept. 12 vs. San Diego. Finished his fifth Major League campaign with 21 home runs along with 26 doubles and 75 RBI, which ranked third on the club...led team in games played (159) and at-bats (587), both career bests...the 159 games played ranked fifth in the National League...struggled over the final two months leading up to the All-Star break and wound up batting just .238 (76-for-320) with seven home runs and 29 RBI in the first half, but caught fire following the break...in his first 47 post-All-Star break contests, hit .335 (60-for-179) with 11 homers and 36 RBI...after committing 15 errors at third base in his first 80 games, made only five the rest of the season... overall in April, compiled a .304 (28-for-92) batting mark...his batting average reached a season-high .314 after going 2-for-3 on May 3 at Chicago...in July 31 win at Cincinnati, collected three hits, including a pair of home runs, three RBI and three runs scored...batted .300 (27-for-90) with six homers and 18 RBI in July...homered in back-to-back wins on Sept. 2 and 3 at Arizona. Began the season on the disabled list recovering from off-season appendix surgery... underwent surgery on March 12 to close a wound in his right lower abdomen that resulted from a ruptured appendix that was operated on in the Dominican Republic on Jan. 12...made two rehab stints at Single-A Vero Beach and Triple-A Las Vegas before being reinstated...reinstated from the DL on May 12, started at third base vs. Atlanta, and went 1x3...appeared in every game the Dodgers played from that point on...batted in the leadoff position on Aug. 15, for the first time since May 18, 1999, and hit first in the Dodger lineup in 19 of 21 games from Aug. 15-Sept. 6...batted .298 (25x84) during that stretch and hit safely in 16 of the 19 games batting leadoff...hit in a career-high 17 consecutive games from Aug. 25-Sept. 18 during which he batted .304 (21x69) with three doubles, a home run and five RBI...his streak marked the longest by a Dodger since Mike Blowers and Mike Piazza both registered 19-game hitting streaks during the 1996 season...was successful in 13 out of 17 stolen base attempts (76 percent)...enjoyed more success on the road, batting .294 with nine home runs and 38 RBI in 66 road games... played shortstop two times, including his first career start at the position on Oct. 7 at San Diego. Tied for third on the Dodgers with 12 stolen bases...hit .321 with eight home runs and 54 RBI when batting with runners in scoring position...had a double, three walks and a career-high three stolen bases on April 29 vs. Florida...was on the disabled list from May 28-June 16 with a strained right hamstring...among the league leaders after the break, posting a .331 average with 12 home runs and 47 RBI...went 4x6 with his second career grand slam and a career-high six RBI on July 27 at Colorado...hit first grand slam on May 21 at Florida; the two grand slams tied him for second in the NL for the season...hit a home run in his only pinch-hit assignment of the season, a three-run homer on Aug. 16 at Florida...earned his first career NL Player of the Week award for the week of Aug. 21-27, when he batted .538 with a home run, three doubles and 11 RBI...collected a hit in seven consecutive at bats on Aug. 24-25, including going 4-for-4 with a double, home run and four RBI in the first game of a doubleheader on Aug. 25 at Chicago...batted .368 (39x106) with five homers and 22 RBI in August...had a 10-game hitting streak from Aug. 20-28, batting .515 (17x33)...led all NL third basemen with 412 total chances and 116 putouts... second among NL 3B's in double plays turned (30). Spent first full season in the Majors...had 36 multi-hit games...batted .302 (19x63) in his last 17 games...swiped 18 bases in 25 attempts, the most by a Dodger third baseman since Pedro Guerrero's 23 stolen bases in 1983...ranked eighth in NL in fewest double plays grounded into (once every 134.5 at-bats) and tied for sixth in intentional walks (12)... batted .290 (117x403) against right-handers...committed 29 errors, the most by a Dodger infielder since Jose Offerman's 35 in 1995. Started at third base in 54 of the Dodgers' 86 games after his contract was purchased from double-A San Antonio on June 24...started 34 consecutive games at third base from July 11-Aug. 14...saw action at shortstop after moving from third to short for the ninth inning in the Dodgers' comeback 4-3 win July 31 at New York...lined a game-tying RBI-double to left field in the second inning off Anaheim's Chuck Finley for his first Major League hit in his first big league at- bat on June 24 at Dodger Stadium...went 2-for-4 against the Angels in his Major League debut...slugged a 418-foot, two-run homer to center field off the Rangers' Rick Helling for his first Major League round-tripper on June 30 at Texas...at age 19 years and 78 days when he was promoted to Los Angeles on June 24, was the youngest player in the Majors ahead of Pittsburgh's Aramis Ramirez (19 years and 364 days)...although he only played in 64 minor league games at San Antonio, he ranked fourth among organizational leaders in home runs (13), seventh in batting average (.321), tied for eighth in stolen bases (20) and ninth in RBI (56) and walks (39)...was named to the Texas League postseason all-star team...was also selected to play for the NL squad in the Double-A All-Star Game on July 8 in New Haven, CT, but did not attend since he was with the Dodgers...following the 1998 regular season, was named the Dominican Winter League MVP after batting .301 with 10 home runs and 37 RBI for the Aguilas...he ranked first among league leaders in runs (39), second in hits (68), stolen bases (17), homers and RBI and fourth in batting average...also was named the Shell Oil MVP...became just the third player in league history to post a 10-10 (HR/SB) season, joining his boyhood idol Jorge Bell in that select group. Was a finalist for Baseball America's Player of the Year Award after being tabbed by the publication as its Single- A Player of the Year following a standout season at Vero Beach...was voted the Florida State League MVP after ranking first among league leaders in home runs (26) and RBI (104), second in runs scored (95) and fourth in average (.317) and walks (67)...was voted the "Star of Stars" award winner in the Florida State League All-Star Game...hit safely in 18 straight games from July 15-Aug. 5...also reached base safely by a hit or a walk in 30 consecutive games from July 15-Aug. 18...led the Florida State League with 12 intentional walks and double plays by a third baseman with 26. Compiled a combined .284 batting average with 26 home runs and 99 RBI after splitting the season with single-A San Bernardino and single-A Savannah...was named the best batting prospect, best power prospect, best defensive third baseman, best infield arm and most exciting player in the South Atlantic League by Baseball America... led all Dodger minor leaguers in RBI and tied for seventh among single-A players in home runs...named to the Howe Sportsdata Minor League All-Star team...also was voted the South Atlantic League's Most Outstanding Major League Prospect...was the South Atlantic League's Player of the Week from June 9-15. October 29, 2018 3B Adrian Beltre elected free agency. May 31, 2018 Texas Rangers activated 3B Adrian Beltre from the 10-day disabled list. May 15, 2018 Texas Rangers placed 3B Adrian Beltre on the 10-day disabled list retroactive to May 14, 2018. Left hamstring strain. May 8, 2018 Texas Rangers activated 3B Adrian Beltre from the 10-day disabled list. April 25, 2018 Texas Rangers placed 3B Adrian Beltre on the 10-day disabled list. Left hamstring strain. September 12, 2017 Texas Rangers activated 3B Adrian Beltre from the 10-day disabled list. September 3, 2017 Texas Rangers placed 3B Adrian Beltre on the 10-day disabled list retroactive to September 1, 2017. Strained left hamstring. May 29, 2017 Texas Rangers activated 3B Adrian Beltre from the 10-day disabled list. April 2, 2017 Texas Rangers placed 3B Adrian Beltre on the 10-day disabled list retroactive to March 30, 2017. Right calf tightness. June 23, 2015 Texas Rangers activated 3B Adrian Beltre from the 15-day disabled list. April 25, 2014 Texas Rangers activated 3B Adrian Beltre from the 15-day disabled list. April 13, 2014 Texas Rangers placed 3B Adrian Beltre on the 15-day disabled list retroactive to April 9, 2014. Strained left quadriceps muscle. September 1, 2011 Texas Rangers activated 3B Adrian Beltre from the 15-day disabled list. August 29, 2011 sent 3B Adrian Beltre on a rehab assignment to Round Rock Express. January 5, 2011 Texas Rangers signed free agent 3B Adrian Beltre. November 7, 2010 3B Adrian Beltre elected free agency. January 7, 2010 Boston Red Sox signed free agent 3B Adrian Beltre. November 5, 2009 3B Adrian Beltre elected free agency. September 1, 2009 Seattle Mariners activated 3B Adrian Beltre from the 15-day disabled list. August 4, 2009 Seattle Mariners activated 3B Adrian Beltre from the 15-day disabled list.